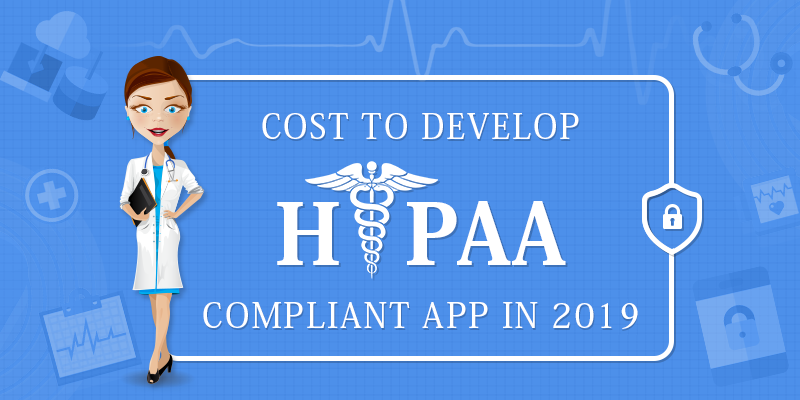 How much does HIPAA compliant app development costs in 2019? If you are an entity in the healthcare domain and have a mobile application that deals with protected health information (PHI), then chances are that you would have to be HIPAA compliant. Healthcare entities like hospitals, clinics, insurance companies, etc. or even business firms who have developed mHealths or EHealth applications revolving around PHI fall under the ambit of HIPAA – Health Insurance Portability & Accountability Act. Well, collecting information does not require you to be compliant, but sharing the information requires you to be. that involves PHI, make sure that it is a HIPAA app. Most entities into Healthcare IT Services that collect and share patient information are concerned about HIPAA since non-compliance can turn to be a costly affair. already or contemplating it, then you need to evaluate what levels of HIPAA compliance you need. This will depend on the PHI (data) you hold and the amount of the data you are sharing. Lesser the sharing, lesser the compliance. , then the app development company should be informed about HIPAA right in the development stage because they have to work on privacy & security rules. would be somewhere around: $4,000 to $12,000. This cost includes Risk Management & Management Plan, Remediation, and Training & Development Policy. For medium or a largely covered entity, the cost of HIPAA would be somewhere around: $50,000 and above. This cost includes Remediation, Risk Analysis & Management Plan, Penetration Testing, Training, and Policy Development and Vulnerability Scans. If the application development costs seem way too higher, the other option available is resorting to a cloud service provider, which is already HIPAA-compliant. While choosing a cloud-based service provider, you must also bear in mind if that service provider will minimize the risk of data breach, and whether the service provider is ready to serve you. that is HIPAA-compliant seem higher, it is always better to be on the safer side to avoid paying large penalties. These compliance errors are apparently too costly to be made. The penalties are heavy due to the nature of the data that is being dealt with. Patient information is very sensitive in nature as it contains medical history. In 2017, IBM & Ponemon conducted a research that gave away some interesting facts. They found out that on an average, a single data breach costs $380 per record, which is 250% more than the data breach across other industries around the globe. Enquire Biz4Solutions’ app development services to know the costing structure of HIPAA compliant app development.